With a multitude of trackers available in the market today, it’s easy to just choose one and start running your offers. But if you’re a newbie, how do you go about actually optimizing them so you can go from red to green? How can you magically turn your campaigns profitable? Enter ClickMagick. ClickMagick is a click tracking tool that claims to have 19 profit-boosting features that you won’t be able to find in other trackers. If you’re as curious as we are, let’s take a look at some of the most promising offers of ClickMagick. With their proprietary algorithm, ClickMagick can detect which of your split-tested offers are showing promise. You will instantly be notified when this happens. MagickPop – show pop-ups depending on your need. You can choose between timed pop-ups, exit redirects, and exit pops. Countdowns – scarcity marketing is an effective tactic to drive the user to opt-in or purchase. Using countdowns on the page can greatly increase your conversions. MagickBar – place a notification bar on any website. This can contain opt-in forms, announcements, countdown timers and more. What’s great is that you don’t even have to own the website or have access to its backend for these tools to be utilized. You only need to provide the link. Similar to the Money Layer Technology, you can utilize pixel retargeting without having to install the pixel on the offer’s website. You just need to provide the link and ClickMagick will do the rest. Get two birds with one stone when you drive traffic to an offer by locking the landing page. This means the user will only be able to view the page once a specific action has been completed, such as opting into your newsletter or having the user share the activity in social media first. Starter Plan – worth $17 a month, but can be reduced to $12 a month when paid annually. 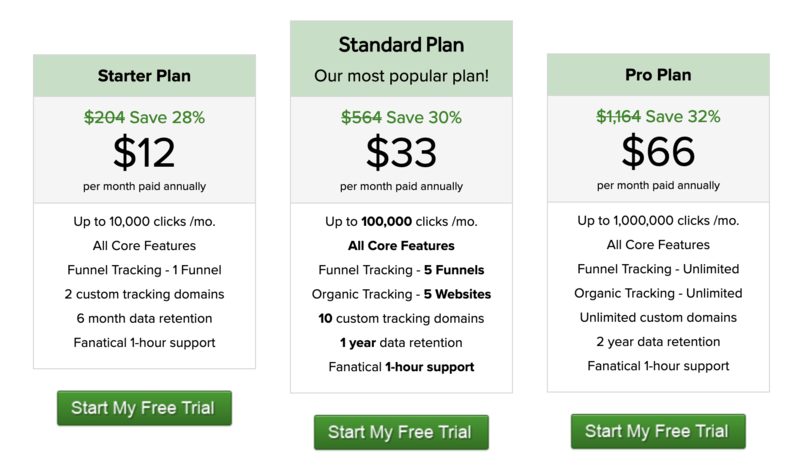 This plan only allows 10,000 clicks per month plus one funnel tracking. Standard Plan – worth $47 a month, but becomes only $33 a month when paid annually. This plan includes 100 thousand clicks a month, tracking of five funnels, and organic tracking of five websites. Pro Plan – worth $97 a month, but is lowered down to $66 a month when billed annually. This includes unlimited funnel tracking and unlimited organic tracking. If you think ClickMagick’s features are awesome and would like to promote them, you can become a ClickMagick affiliate and earn 35% recurring commissions. Their minimum payout is $50.